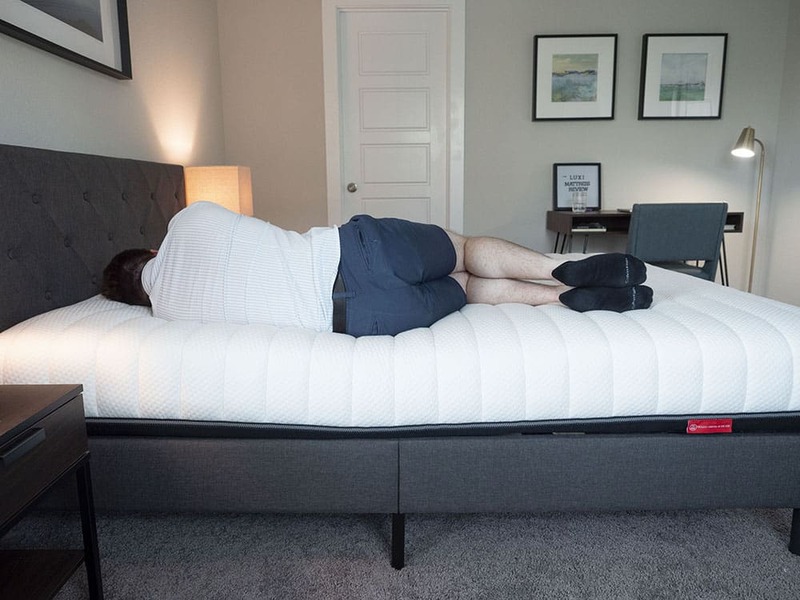 Home » Luxi Mattress Review – Customizable Comfort? Luxi Mattress Review – Customizable Comfort? The Luxi mattress has a very interesting concept. It is customizable to fit your firmness preferences. By flipping the components of the mattress, you can have a soft, medium, or firm mattress. In addition, for Queen mattresses and larger, the mattress is split, so each side can be customized to fit two people’s individual needs. I was excited to try out the Luxi for myself and see if this 3-in-1 mattress really does offer something for every type of sleeper. Which side will of this mattress will be the best fit for you? Read on for my full review. Note: We’ve received some complaints about the customer service at the company and the company not honoring return requests, so we just wanted to make a note of that at the top of this review. You sleep with a partner. If you choose a Queen size or bigger, the mattress is split in two. This means each partner can choose how they want their side configured. Also, this cuts down on motion transfer, so you shouldn’t feel your partner moving around at night. You sleep hot. The latex is perforated and the grid system also allows for a lot of airflow. You shouldn’t be sleeping hot on this mattress. You are a side sleeper. This mattress relieves pressure quite well on the medium configuration. The grid system conforms to your body when you are on your side, so you shouldn’t feel too much pressure on your shoulders on hips. If you want something even softer, you can switch to the softer configuration. You want a very supportive mattress. If you sleep primarily on your stomach or back, this mattress might not be the best fit for you. Even on the firm side, there are soft layers right below that firm top layer. I personally require more support when I am on my stomach or back. You are a stomach sleeper. Even on the firm side, I didn’t feel like the mattress gave me enough support on my hips. I think this is because there are soft layers right below the firm upper layer. Without a firm base layer, this mattress lacks the support I need when I am on my stomach. The mattress is 10.25” tall. The cover is soft with memory foam quilted into it. In the medium configuration, the first layer is a 1.5” springy latex layer. Then you have a 1” layer of a fast-responding memory foam. Then there is a 3.5” grid layer called SBT for Support Balancing Technology. The base layer is 3.5” of a standard polyfoam. All the foams in this mattress are Certi-PUR US certified. This means they are eco-friendly. The Luxi is made in the USA. The mattress is available in Twin, Twin XL, Full, Queen, King, and California King. The latex layer has holes in it that allow for airflow. The SBT grid also has larger channels built in. These both help keep the mattress cool. The SBT grid is designed to contour to your body, relieving pressure while still keeping you supported. The columns will collapse under the heavier parts of your body. If you buy a Queen size or larger, the mattress will be split in half. Each side can be configured to fit your and a partner’s specific sleeping styles. They also offer the Luxi One, a mattress without the 3-in-1 construction. See how the Luxi compares, here. In the medium configuration, I felt like the mattress was a 6/10, a bit softer than average. You also have the firmer and softer side which, of course, felt different. On the medium side, I felt very nice pressure relief. There was little no pressure on my shoulders. On my back, there was decent overall support, but I definitely needed more support when I was on my stomach. The softer configuration was even more pressure relieving when I was on my side. However, the firmer side still didn’t give me the support I needed when I was on my stomach. In terms of feel, the mattress has a bit of bounce to it. 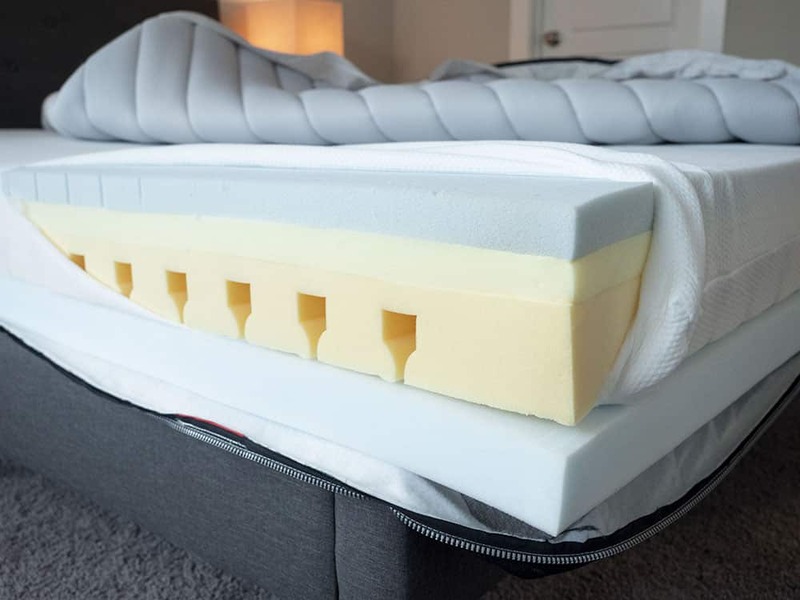 The memory foam layer is fast to respond, so you get that pressure relief without getting “stuck” in the mattress. Being that this is an all-foam mattress, I expected the Luxi to isolate motion well. Also, the mattress is split down the middle, and this should help even more with motion isolation. When I moved around the glass during my tests, there was only a little disturbance. When Marten moved around on the other side of the mattress, I barely felt his motion at all. Considering this, I think the Luxi could be a great mattress for couples. 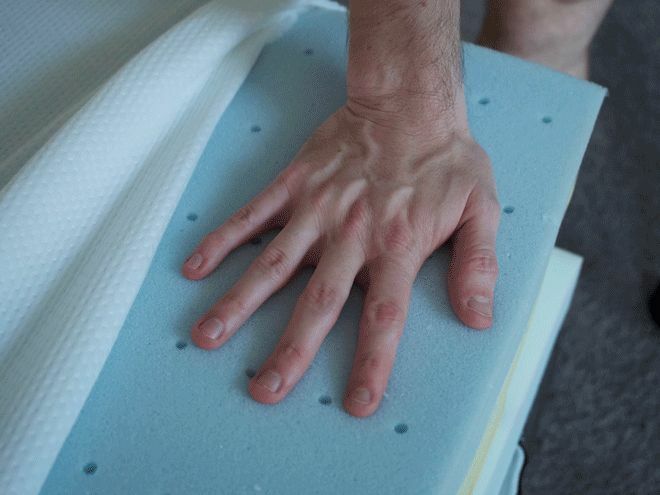 All-foam mattresses aren’t always the best when it comes to edge support. Sitting near the edge of this mattress, I did feel the mattress compress. However, I did not feel like I was going to fall off. Likewise, lying down, I didn’t feel like I was going to be thrown off the bed. The edge support is not, overall, a highlight of this mattress. The Luxi is a very interesting mattress because you have multiple firmness options. You have a soft side, a medium side, and a firm side. On the medium side, I felt it was a 7.5/10 in terms of firmness. When I was on my back I felt the best. I had a really nice overall support. On my stomach, I sunk in a little bit at my rib cage. On my side, I felt some pressure on my shoulders and my hips. On the softer side, I felt it was a 6/10 in terms of firmness. This felt very nice on my side, but it was a little too soft when I was on my stomach. Still, there was some decent support when I was on my back. The firm side didn’t work for me. I sunk in through that thin firm layer and felt the soft layers beneath. I didn’t get the proper support and it also didn’t relieve pressure when I was on my side. Marten is heavier, so he needed a little more pressure relief when he was on his side. He opted for the soft side, and this seemed to give him the needed relief on his shoulders. We both felt that there was good support when we were on our backs. Marten and I agree that neither side of the mattress is ideal for stomach sleepers. Even the firmer side did not give enough support for Marten. It has multiple firmness options in one mattress. There are three configurations so you can choose which configuration fits your sleep style. The mattress is great for couples. The two separate sides mean you and your partner can set the mattress to your specifications. And there shouldn’t be too much motion transfer from one side to the other. The grid layer relieves pressure very well. When you sleep on your side, it conforms well to the curves of your body. This is a great mattress for sleeping cool. The latex layer has holes and the grid layer has a good amount of room. These both help with airflow and keep the mattress from getting too hot. The Luxi is a great option for couples, making it easy to customize the firmness on each side of the bed. It is also ideal for side sleepers and hot sleepers. The Luxi 3-in-1 mattress is a bed-in-a-box mattress, which means it will come compressed and be shipped straight to you. You will want to begin by removing the rolled up Luxi mattress from its box. Then, preferably with another person’s assistance, position the roll on your bed. Carefully cut away the first layers of plastic until the still-compact mattress can be laid down flat. Then, pierce through the final layer of plastic and the Luxi will expand. Simply clear away the excess plastic and allow your mattress to breathe and fully expand. The Luxi is a very interesting mattress. Its 3-in-1 construction makes it a good fit for back, side, and combination sleepers. However, if you are primarily a stomach sleeper or you prefer a firmer mattress, this might not be the best choice for you. The company also offers the Luxi One mattress which does not have the customization option that comes with the 3-in-1. Luxi also offers bedding accessories. This mattress comes with a 100-Night Trial period and 10-year warranty. Luxi also offers free shipping and returns. Financing is also available. Thanks so much to all who took the time to write these comments about the company’s customer service, and to Joe for posting them. I was considering this mattress, and this information has saved me a lot of grief! Add my name to Buyer Beware. I have a Luxi and love it. So much, that I bought another on November 23. It’s now nearly a month later and aside from receiving the initial “order placed” email, I’ve received no communication from Luxi. I’ve reached out via phone multiple times–initially it would go to voicemail now it’s just a busy signal. Two emails asking for an estimated delivery date have been unanswered. On their website, my order says “paid – unfulfilled” with no other info. I’ll have my credit card company reverse the charges, but to me, it looks like they’ve shut down. Guess I’m out of luck with my warranty on the bed I own. Buyer beware! I, too, have been trying to get a refund for over 2 months. After receiving an email on 11/2/18 that the Ceo would contact me to approve the refund I have had absolutely NO contact from Luxi. I have sent numerous emails and left voicemails but Luxi has refused to contact me since 11/2/2018. They are not honoring their 100 night money back guarantee and have an F rating with the BBB (I discovered too late). I have also filed a complaint with the FTC and hope some action is taken, as my opinion is that they are engaging in fraudulent business practices by advertising a money back guarantee and then refusing to honor it. Karen, not sure of my other reply worked. CA DOJ has replied that they received our complaint, but there hs been no further action that I know of. Our attorney now is handling this matter with LUXI. Luxi claims to offer a 100-night sleep trial, and a nice long warranty, but customer service will simply not process any returns or refunds. They don’t tell you “no,” they just… ignore you. I was even contacted by the company’s CEO, David Farley, personally after I filed a complaint with the Better Business Bureau—and then he also ignored every one of my replies. Other complaints online, like those above, tell me that this isn’t an isolated incident. Your review mirrored my experience exactly….David Farley strung me along until it was past the 100 days and then stopped contact with me. Now, less than a year later, I’ve had to replace the crappy mattress that became so uncomfortable and saggy and unsupportive I was in pain with something else and I’m out the $1000+ I spent for the bed. I tried calling their phone number for the last 1/2 month with no connection. It seems that I am having the same issues with returns as others on this site are experiencing. I just left Luxi the below review on their site. TLDR; they don’t honor their warranty. Don’t expect to get your $ back, best bet is to do a charge back to your CC. We purchased a LUXI mattress 100 nights ago and contacted the company saying we didn’t like it enough to keep it. We have been getting the runaround ever since. Same story, they will have customer service call us, will work to change mattress, now the CEO is supposed to call us. All we want to do is get our refund. This is the only mattress company we have had problems with, after trying several. So sad. I think we are stuck with it. DO NOT PURCHASE ONE. BUYER BEWARE! LUXI does not honor their money back guarantee. We have reported this company to the FTC and the California Dept of Justice for fraud. KP & GW- First and foremost, if you read this reply, I am very much interested in knowing the result of you reporting LUXI to the California Justice Department. I do not know if you are supplied my email with is reply, but if you are, feel free to contact me. Like many of the reviewers, I too have not gotten my refund. I originally put in the refund request in January 2017 and was told that Heloise would get back to me as to the process. Shortly after, I was faced with family health issues which culminated in my husband’s death in November 2017. After a few months, in February 2018, I was finally able to try and resolve this issue and sent an email outlining what had happened. From February, until aproximately July 2018, there were over 29 emails between me and Samantha at LUXI, to no avail. She apologized saying Heloise was no longer with the company and my refund “fell through the cracks” and that they would take care of it. The LUXI mattress was a twin for my daughter. I told Samantha that after some remodeling was complete, I may be interested in a queen size to try myself. She and her boss, that she spoke with, so she said, were more than happy to sell me a new mattress and work a deal for the price and my refund. I was not ready for a new one until the remodeling was complete, which is still in progress. After I told her I just wanted the refund at this point, the song and dance started. Weeks would go by between refund promises which I had to follow up on. Each time I made contact, there would be another excuse…”The accounting department should have done that. I will check for you.” No response until I called. The accounting department excuse went on a few times, then it was “They no longer had my purchase on file so there was no credit card to refund to. Send your address and we will send a check”. Then we were back to the accounting department excuse again. The clincher was, after many weeks of no response to me, and after sending all correspondence including the 29 emails, I was told that “they thought I had put in a dispute with my credit card company and could not get an additional refund”. What a joke! I then put a complaint into the Better Business Bureau where LUXI has an F rating. I believe that is the lowest rating possible, so I did not expect this would end well. I was right. They never responded to the BBB. Actually, when you deal with companies that practice consumer fraud, the BBB is useless. If the company does not respond to them, there is nothing that they can do and obviously, by their F rating, LUXI does not care about their business image. The internet has not been kind to buyers. It has opened the door for new age thieves that know if they rob 50% of their customers, the other 50% of their sales will make them wealthy, and they will continue to sell product because the market is now, not only local, but world wide. So, why should they care about the consumer? They don’t. I still have a few tricks up my sleeve, but frankly, I can only hope that anything I do will bring to light Luxi’s illegal business practices. I seriously doubt I will get a refund. On a side note…I have been fighting the same issue with an EBay Seller named Ebuy USA out of New York and New Jersey. That is a ridiculous story! The reason I talk about this is that yesterday, I was in conversation with Ebay, because in this case, that company not only defrauded me, but also defrauded Ebay. Without going into detail, one bit of advice from Ebay was to report the company to my local police. I found that interesting since I have never been told to do so before, and honestly, I am not sure that the local law will even take the complaint on an internet seller out of state, but it is worth a try. The same advice may apply to these fraudulent LUXI sales. Do with it what you will! We have had no response from LUXI. CA DOJ has registered our complaint but there hs been no further correspondence from that dept. Our attorney now is handling this matter. I have also filed complaints with the FTC and BBB. Have you had any updates from them? I would really think twice before I purchase a LUXI mattress! If you buy this mattress you better hope you LOVE it because if you don’t you will have a VERY hard time trying to make a return! My journey begins on 08/11/15 when I tried to call and talk to a customer representative about returning my LUXI mattress and got no answer so I left a message with no return call. So I tried again the next day with no answer and no return call. So then on the 08/14/18 I sent an email to LUXI asking to return my mattress and did get a response Samantha who was very helpful at the time. Over the course of a couple of emails I explained to her our experience with the mattress and how it just wasn’t working for my wife and I. She then said that someone from the Claims department would contact me to move forward and they would get this taken care of. A couple of days go by and I receive a phone call from the CEO of LUXI mattress! We had a very good conversation and he talked about how he could make the mattress work by sending us out two new pieces of foam for the bed. He ask me if we would try this and I agreed. So lets forward 2 weeks to 09/04/18 and we haven’t received the 2 new pieces of foam let so I emailed Samantha. She says it was ordered and will send me tracking info once she has it. So on 09/06/18 she does send me tracking info showing that the new foam was not shipped until 09/05/18! So basically the day after I contacted her! That foam should have already been on the way at least if not to my house, so then I emailed back explaining that this was not acceptable and we had bought another mattress and wanted to return the LUXI mattress. So then the excuses begin “we are waiting on the foam to get returned to our warehouse to start the return process on your mattress”. So UPS tracking showed the foam was returning to LUXI on 09/17/18. So then on 09/19/18 “Waiting on confirmation we received the foam back to the warehouse, the we will send you our return authorization form”. Then on 09/25/18 I emailed them the UPS tracking info showing where the foam had been delivered back to them on 09/17/18 with no response! Then again on 10/01/18 with the UPS tracking info and again no response! As of today 10/09/18 I have still not received a “Return Authorization Form”! This has been an absolute terrible experience with no resolve. I’m begging everyone to think before buying a mattress from LUXI!!! Hey everyone just wanted to update. I finally received a “Return Authorization” and I donated the mattress but once I turned in all the paperwork back to LUXI I never did get a response. So I disputed the charge with my credit card company and they issued me a refund for the mattress. So I would recommend everyone that is having an issue with returning the mattress to do the same. LUXI will not refund your money! The concept of adjustability of the mattress is great, but the mattress has not been comfortable for me and my husband. We have tried all of the comfort levels and still do not find the mattress to be comfortable. I have developed hip and back pain, and the Luxi mattress aggravates the pain, and I am not able to sleep well. I reached out to Luxi and still have not had a resolution. They initially said they would help try to resolve our issues but they do not return emails, and it has been several weeks and no response. We have not found them to stand behind their guarantee. If you decide to purchase this mattress be mindful of the 100 night trial date, and make sure if it isnt working for you you email them within the 100 nights. Have read other reveiws where people didn’t get their money back and didn’t get issues resolved. We made a big mistake purchasing a Luxi mattress. My husband and I purchased the Luxi mattress hoping it would be perfect for us since it was adjustable. Let me start by saying the pillows they have are amazing!! The mattress is very well made and the cover is really nice and plush on top. I found the mattress to be comfortable and really like it. I used the softest setting. My husband on the other hand could not get comfortable and had back pain no matter how we adjusted it. I contacted customer service and they were really nice and made attempts to get the mattress just perfect for us, but we were unable to find something that would work for my husband. So we started the return/refund process – the part that took the longest was getting an appt. for pickup from a donation center – that took well over a month. This put us outside our 100 day trial period, but customer service at Luxi told me that would not be an issue. Once the mattress was picked up and I submitted my paperwork – I received a full refund within 10 business days. I was never able to reach anyone by phone if I called, but i did receive a return call within a couple business days after leaving a message. Email response times varied from a couple hours to a couple days- I assume it is because they are growing faster than what the current customer support can handle. I did always get a response though. Irregardless is not a word. The correct word is regardless. Welcome. The pillows arrived a couple of days ago and they are very nice too. Similar to hotel down or down alternative but blends in some of the memory foam feel also. Just glad the wife is happy and able to sleep well again and hope this info helps those who need it. This mattress is great. Kinda like the ‘Goldi-Luxi-Zone’. 3rd times a charm. We tried tried a big-named bed in box competitor earlier this year but she found too firm. It was ideal for me though with latex on top of gel foam. She slept on old guest bed due to pain and decided to go back to coil. We found a hybrid from the nearby store and it was also too firm and really opposite of what was claimed on site having high motion transfer, heat and pressure points. Then, while considering a split twin mattress option (with a crack between) we found Luxi. It didn’t take long to adjust. She loves the ‘soft’ option while the medium works for me. To try and describe mattress feel, it is not hard but is supportive. It does not sink in like a foam topper does. It has bounce/response similar to a spring mattress. You can get 7-8 hrs of solid sleep on Luxi. Then, you’ll get up because you are refreshed. She likes her side of the mattress so much though she wants to stay in bed. This reply is to help those who make sleep a high priority. It seems many of the online mattresses tend to sleep on the firmer side if you are lighter in weight. Luxi seems to have a true ‘medium’ feel and good on not sleeping hot, low motion transfer and no pressure points and you can customize with ease. If it weren’t for considering a slightly higher price range than the other boxed mattresses, after trying local store, we may not have found it. This seems to be a case where the price difference is justified as quality seems higher. Check out the Luxi and the company history/bio. It is worth it. BTW, I’m 5’11” 175 lbs and she 5’5″ 135 lbs. Semi-athletic build. Customer service is great too. Thanks for your thoughts, Trevor! One of the BEST mattresses I’ve slept on in my life!!! I purchased a Sleep Number i8 King Mattress set a few years ago and was initially happy with it for sleep after getting used to properly sleeping on it. However, after about a year the pump malfunctioned and wouldn’t work. No suitable fix found online and the company wanted almost $300 for a new one. I wasn’t having any of it and heard about Luxi on my local a.m. radio station. While initially reluctant I purchased it and have been getting extremely wonderful sleep ever since (about a year now). The customization was very helpful because after a few weeks I opted to change it for a bit more firmness and it’s been on the firmest setting since then. No issues with night sweats, sagging, hot spots, or any other typical issues. The not-sagging was very important since I am 6’3″ and 285 pounds. Sad I don’t hear anything about Luxi (Bed in a Box) anymore on the radio but I am an extremely happy customer. Thanks Luxi, you’ve really revolutionized the industry.